The Rhode Island Department of Transportation said it wrapped up its $3.6 million Railroad Avenue Bridge replacement project seven-months ahead of schedule due to the use of a "Bridge-In-A-Backpack" system developed at the University of Maine and commercially offered by Advanced Infrastructure Technologies. The agency said the system uses corrosion-resistant fiber reinforced polymer or FRP tubes in place of conventional steel rebar embedded in a concrete arch or concrete beams. Using those tubes, along with pre-cast concrete components, helped the agency replace the bridge and re-open it to traffic in just four months, said RIDOT Director Peter Alviti, Jr., in a Dec. 13 statement. "The components used on this bridge will extend the longevity of bridges versus conventional construction materials," he said. "They also provide an added benefit, that being rapid installation that shortens the duration of closures for construction." RIDOT noted that it worked with the state's Department of Environmental Management to "time" this particular project with the "low-flow" period of the Clear River, which passes underneath the bridge – a bridge via which some 200 vehicles cross per day. 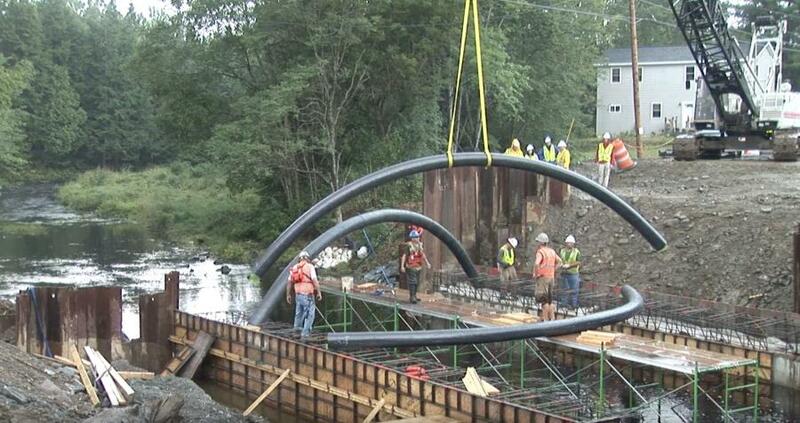 The agency said this is the first project in Rhode Island to use this "Bridge-In-A-Backpack" construction method. Next year, RIDOT said it plans to use the same approach to replace the Barbs Hill Road Bridge in Coventry.